If you know anything about fashion, then you know how influential Jackie O was as a fashion icon. 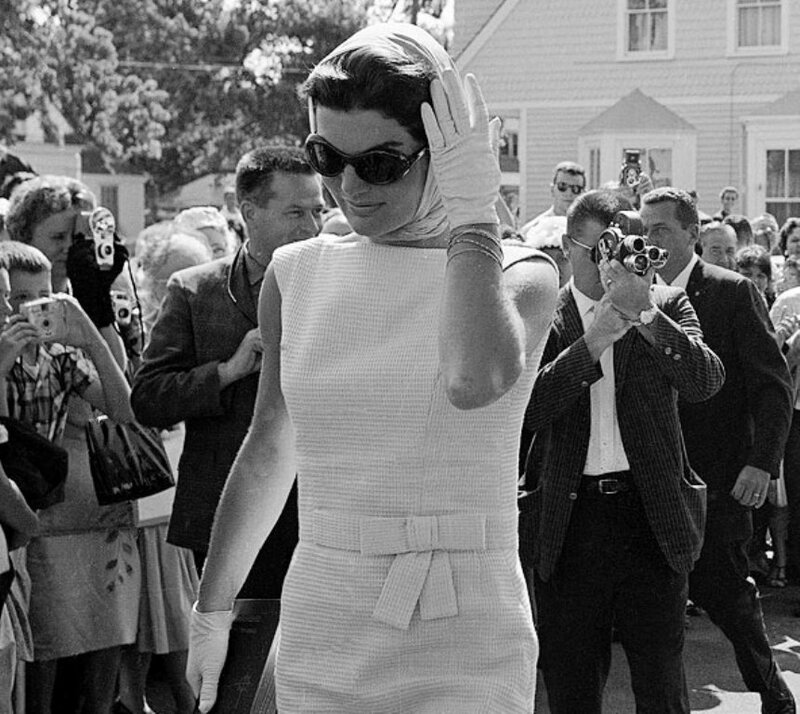 When you think Jackie O, you think of a mod pillbox bob, statement sunglasses, white gloves and prim and proper mod dresses. She was able to incorporate a refined look to the mod 60’s look. She always bought sophistication to her outfits, and whether it was due to her physical look or her statement pieces, she was sure to make a fashion statement every time she walked in a room, while keeping her outfits refined yet posh. Some of these looks are even very well followed today. So, let’s take a step back in time and take a look at some of these fashion statements she made. In the early 60’s Jackie O was still Jackie Kennedy, as John Kennedy’s wife and first lady. This is when her fashion was recognized. It’s when she created a name for herself as one of the most influential fashion icons of the time. Jackie Kennedy in her infamous sunglasses and head scarf. The 60’s were known for their mod retro looks such as the looks that Twiggy and Jean Shrimpton made famous. Jackie was able to add a refined touch to it, creating her own style and statements. How did she accomplish this you ask? Well, with added statement pieces to many of her outfits, she was able to create unforgettable ones. Of course, she also had the help of wonderful designers such as some of her favorites, Coco Chanel, Oleg Cassini, and Christian Dior. One of her very well known statement pieces was the large sunglasses she wore often. Whether with a polished or casual look, she knew how to wear them well. From large round sunglasses to large square sunglasses, they were always fitting. Sometimes, she would even pair them off with a scarf over her hair, which was another one of her signature pieces. Sometimes in lace and sometimes in silk—she managed to make the look charming and sweet. I can’t forget the pill box bob. Her infamous bob was never amiss and with the added pillbox hats, it only added flair. Then there were the often used pearl necklaces and the never forgotten white gloves. Most often she wore short white gloves, but for grander events she could have been seen wearing white gloves that went above her elbows. 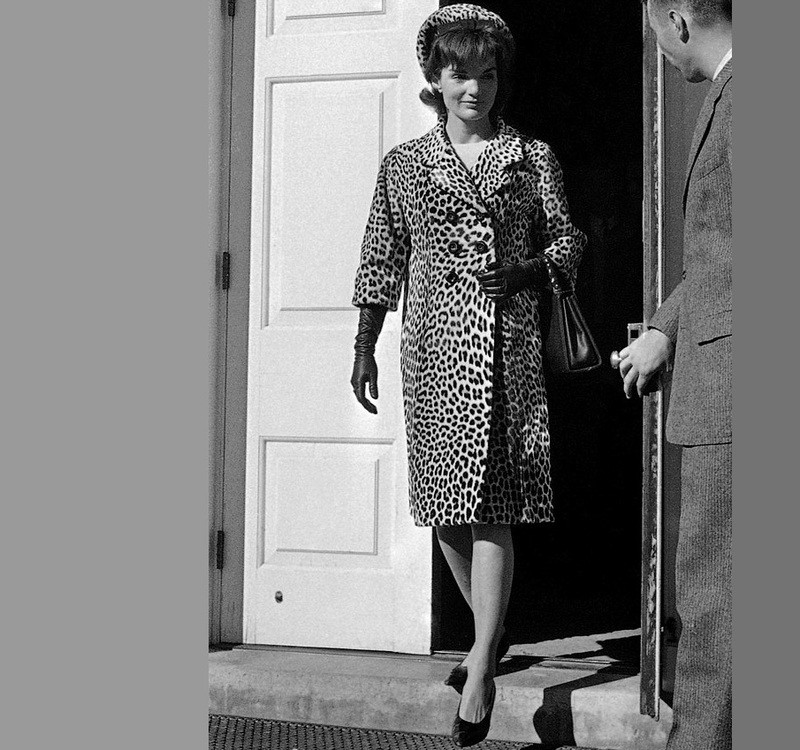 Jackie Kennedy in a double breasted leopard coat and pillbox hat. Jackie O wasn’t all statement pieces though. She usually stayed among a certain type of dress. Her dresses often had higher necklines. They were often the bateau or jewel necklines, but there was also turtle necks and the off shoulder neckline as worn for her wedding with John Kennedy in 1953. The dresses were often slightly a-line classic cuts with short cap sleeves, and they were likely to be cinched at the waist with possibly a bow. 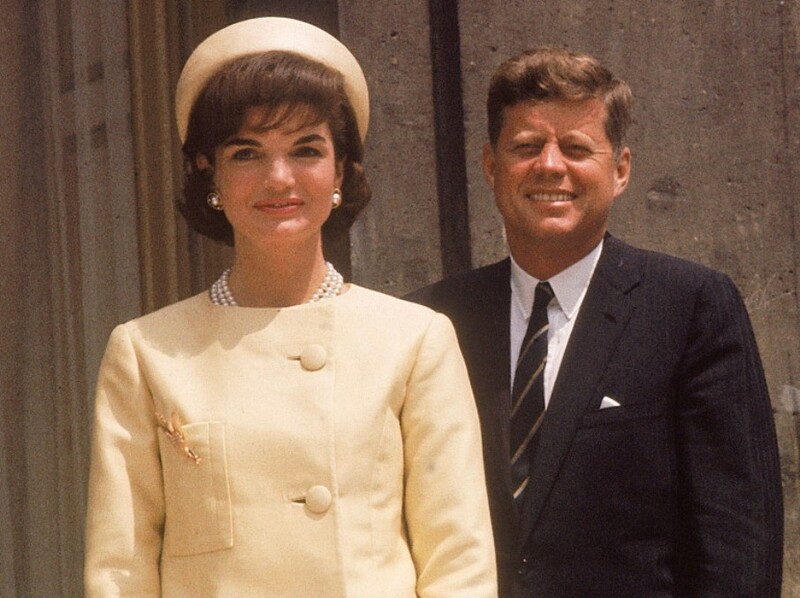 Other often seen styles in Jackie O’s wardrobe were the monochrome dress, double breasted coat and short pointed heels. Bringing this all together, you have the Jackie O look: a polished, refined but elegant, mod and chic look. In the 70’s Jackie officially became known as Jackie O. She married Aristotle Onassis in 1968 but was widowed for a second time in 1975. In these years she became a target to paparazzi and was officially nicknamed Jackie O. During this time, Jackie O’s style changed to something that was well fitted to the 70’s and her Mediterranean lifestyle in Greece. Even still, she remained as fashionable as ever. Jackie O in a joyful smile and a more fun casual 70’s look. The 70’s was marked by a boho-type look along with a glamorous rock style. Perfect examples of these styles are Olivia Newton John, Stevie Nicks and Debbie Harry. Forever fashionable, Jackie O, was well in touch with the 70’s along with her own added touch of Mediterranean flair. During these years, you could easily find Jackie wearing more boho type skirts. She would wear shorter cut dresses which became more popular during the time. More often than in the past, she would wear colorful retro patterns, along with slightly wide-legged pants. You could also often see her wearing wide belts; it was very 70’s. No longer did she always carry around small geometrical bags or clutches, but instead, she would use larger boho-type bags too. Her famous pillbox hair was no longer worn like she once did. Incorporating her Mediterranean lifestyle, she would wear low buns at times. She never said goodbye to her large statement sunglasses though; they were a Jackie O icon. Overall, her look was a more casual fun with a little 70’s flair. 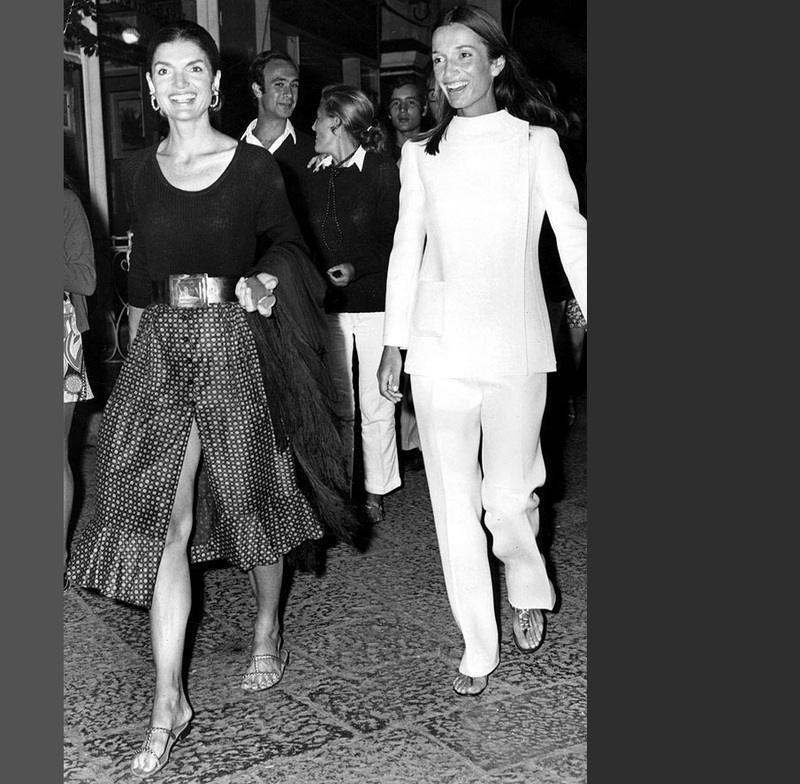 Jackie, only 4 years before her death, still as fashionable as ever. After being widowed in 1975, Jackie O decided to finally focus on something she loved; she became the editor of Viking Press and later Doubleday. She continued to work as an editor till the end of her days. She remained well dressed and fashionably presentable till the end as well. Previous Post: « Making a Case for "Living Life Through a Lens"